This summer at Nauset Marine in Orleans, Mass., Boston Whaler re-enacted its legendary stunt of cutting one of its foam-filled unsinkable boats in half and taking both floating halves for a spin on the water. Not to be outdone, South Florida boatbuilder SeaHunter recently hoisted one of its 7,000-pound, 35-foot center consoles about 20 feet in the air with a crane before dropping it to the concrete yard at Plantation Boat Mart, cutting it in half and taking both halves onto the water. 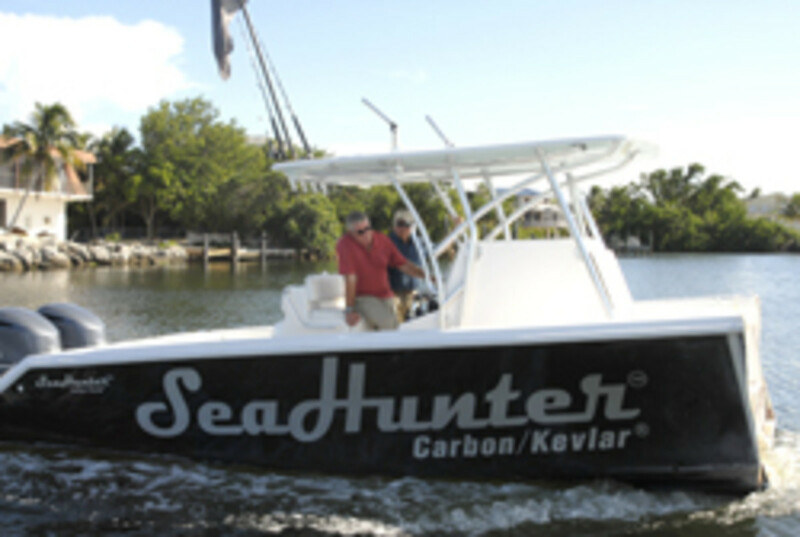 "We came up with this idea to show people how strong the boat is," SeaHunter Boats president Ralph Montalvo told the Miami Herald. "The ultimate crash test." "We knew we had a strong boat, but we didn&apos;t know exactly how strong it was," SeaHunter vice president Charlie Schiffer told Soundings Trade Only. "We figured the boat would suffer some pretty severe gelcoat damage, but we had only some gelcoat separation and cracking -- maybe about $500 in gelcoat repairs. That&apos;s it, though. It&apos;s really ridiculous how well it held up." The company plans to use the footage for a TV and Internet commercial, but had yet to post it on YouTube. Click here for the full article with a photo slideshow.